On his return to Paris, Henri Cernuschi had the opportunity of showing his collection to the public at the Exposition Orientale, while he worked on the design of the mansion he was having built on Avenue Vélasquez to house the collection. The façade was designed as a manifesto of Cernuschi’s ideals. Over the entrance to the museum were two mosaic medallions of Leonardo da Vinci and Aristotle, an allegory of art and science. And the Florentine-style gate bore two inscriptions, “février” and “septembre,” references to two events that were important to Cernuschi: the fall of the Bourbons in 1848 and that of the Bonapartes in September 1870 after the defeat at Sedan. A sense of theatricality governed the mansion’s interior design. In the main staircase in the entrance of the museum (which opened to visitors in 1875), on the first floor, an Italian Renaissance tapestry hung next to an embroidery hanging of the Seven Sages of the Bamboo Grove; while on the second floor hung a tapestry of the Descent from the Cross in the form of a nehan-zu (a painting depicting the Death of the Buddha, Parinirvana). 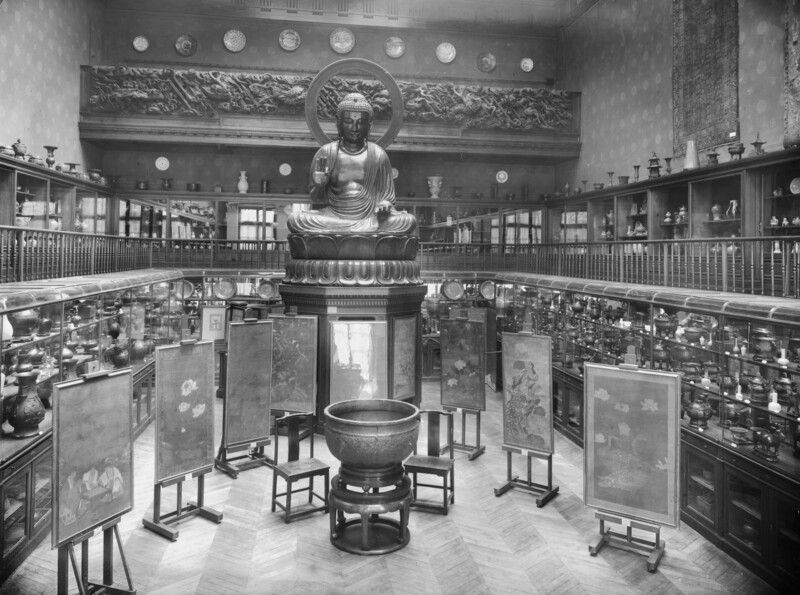 Chinese ritual vessels were displayed opposite bronzes and okimonos in the bronze gallery, where the arrangement of Buddhas, divinities and animals strangely resembled the composition of the nehan-zu acquired by the collector in Japan. Buddhist swastikas in the wallpaper echoed the Greek motif in the floor at ground level. The mansion was built around a large central hall, in the middle of which stood the 4.5-metre-tall bronze statue of the Buddha Amida. One gallery contained a large relief of dragons flying among clouds, the pediment of a Japanese temple, forming a parapet behind the Buddha. The width of the room had been calculated to house this great relief measuring 13 metres long. The arrangement of the works in the bronze gallery was a work of art in itself, based on the juxtaposition of objects and the dialogue between them. According to Cernuschi, art was a shared human language. The fact that identical forms or symbols had appeared in civilisations distant from each other pointed to a common origin, a transmission from one continent to another, proof that societies had gone through similar stages of development. Louis Emile Edmond Duranty (1833–1880) wrote, after a visit to the museum, in an article entitled “La Collection Cernuschi” in La Vie moderne, 1 May 1880, that the Cantonese armchairs set among Greek-style columns gave the impression of entering into the home of a “Greek Mandarin”. But “as curious as this combination may have seemed at first glance, it was in fact not so strange”. Henri Cernuschi wanted to be seen as a man who crossed borders, always with one foot on either side.